Between the years 1530 and 1598, Malta was under the governance of the Roman Catholic Order of St. John. This order, which has been called by many names as a result of the many changes and developments in its history, came into existence all the way back in the 11th century. The original purpose of the Order was to tend to sick pilgrims visiting the holy city of Jerusalem. On February 15th, 1113, the Order was officially named the Hopitallers of St. John of Jerusalem and was officially recognized by the pope. The activities of the Order expanded to include military involvement in the fight against Islamic aggression. The knights came from Europe’s noblest and wealthiest families. Beginning in 1291, the knights operated for a short time from the island of Cyprus after being driven out of Jerusalem by Islamic forces. 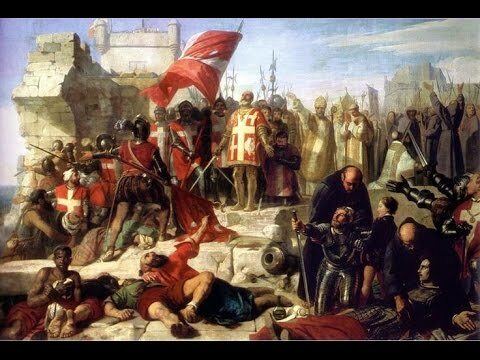 In 1309, they gained possession of the island of Rhodes where they remained for over 200 years until driven out after a 6 month battle with the army of Sultan Suleiman of the Ottoman Empire in 1522. 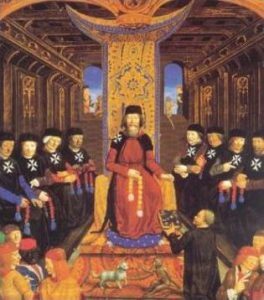 The knights were without a a territory of their own until 1530, when they were granted possession of the Maltese Archipelago by the Holy Roman Emperor Charles V. A provision was made that each year the Order would pay a tribute of one falcon to the emperor’s Viceroy of Sicily on All Saints Day (November 1). The annual falcon tribute was paid each year until 1798 when the Order was driven out by Napoleon. 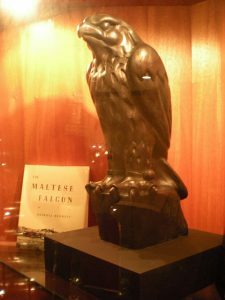 In the famous film noir “The Maltese Falcon”, starring Humphrey Bogart and Mary Astor, the plot revolves around a mysterious bejewelled statuette of a Falcon. Although the statuette used in the movie sold at auction for a staggering 4.1 million dollars, and is one of the most coveted pieces of movie memorabilia of all time, it has nothing much to do with the falcon tribute of the knights. The statue in the movie was made up as part of the story by author Dashiell Hammett in his 1929 novel by the same name. 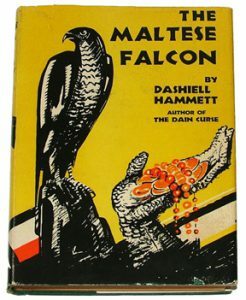 The Maltese falcon paid by the Knights of St. John was a real peregrine falcon. This bird, which had a wingspan of 3 and a half feet, could dive at speeds of up to 200 mph. 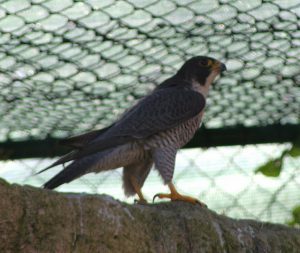 In 2015, three pairs of the peregrine falcon were discovered, marking a return of the bird to the archipelago, where it had been last seen on Gozo in the 1980s. 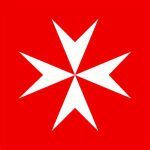 Another legacy of the Knights of St. John is the Maltese Cross. It’s 8 are said to symbolize several things. First off, they refer to the 8 obligations of the Knights of St. John, which were (1) to live in truth, (2) to have faith, (3) to repent one’s sins, (4) to give proof of humility, (5) to love justice, (6) to be merciful, (7) to be sincere and whole-hearted and (8) to endure persecution. The points also refer to the 8 Langues, or ‘tongues’, meaning the lands of origin of the members of the Order. These were Auvergne, Provence, France, Aragon, Castile, England, Germany and Italy. It was also taught that they refer to the 8 beatitudes of the biblical sermon on the mount. The service organization of the Order has also applied secular meanings to the eight points which are meant to describe the traits of a good ‘hospitaller’. They are – observant, tactful, resourceful, dexterous, explicit, discriminating, persevering and sympathetic. The Maltese Cross continues to be the symbol of the Malta and it’s military to this day. After the Order lost control of the islands, it eventually became headquartered in Rome, where it remains to this day. Although no longer possessing any territory, the Order continues to be a sovereign power and issues its own passports, currency and postage stamps. It employs about 25,000 doctors and nurses who are aided by about 80,000 volunteers worldwide. They continue to provide assistance for children, the homeless, the handicapped as well as refugees around the world.